The aim of this lecture is to present on the Density Log. 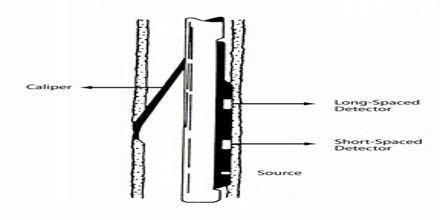 The formation density log is a porosity log that measures electron density of a formation. Dense formations absorb many gamma rays, while low-density formations absorb fewer. Thus, high-count rates at the detectors indicate low-density formations, whereas low count rates at the detectors indicate high-density formations. Therefore, scattered gamma rays reaching the detector is an indication of formation Density.